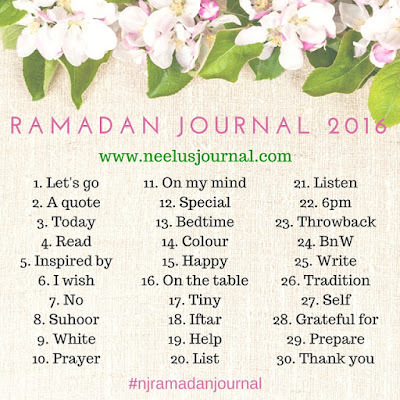 I was happy to see that Neelu of the Neelu’s Journal blog is hosting the Ramadan Journal Challenge again this year. She mentioned that she was undecided about whether or not to keep a journal this year and in some years in the past she has chosen not to. I was undecided also about whether I wanted to participate due to trying to focus on spending enough time on rest and worship. I’m glad she set the prompts for this year and have I decided I will participate with her advice to not over think or spend too much time on it, but to write spontaneously about what comes to mind. You can join in with your own private journal, or on your blog or social media. Neelu provides a hashtag for people who want to join in on Instagram: #njramadanjournal (her feed is here). Do leave a comment on her blog if you decide to join in with journaling your Ramadan. The prompt for the first day is “Let’s go” and the first think that comes to mind is “lets go to sleep”. I have been yawning all day after going to bed at about 12.15am after finishing the taraweeh prayer (the night prayer for Ramadan) last night. I was up at 2am to make the dawn suhoor meal (hubby mentioned paratha’s and fell asleep again). I got up at 6am for work, but Little Lady’s school has changed her school hours to a later time and Little Man’s hifz (Quran memorisation) class will not be running during Ramadan, so I think I’ll be getting up later for work. The only way I will manage with this kind or routine is by napping in the afternoon after work. The noon or afternoon nap is a sunnah (tradition) of our Beloved Prophet (sallallaahu alaihi wasallam), often called qaylulah and is said to have many benefits. I think it will be a life saver for me and the only way I will get through this month without keeling over from sleep deprivation.